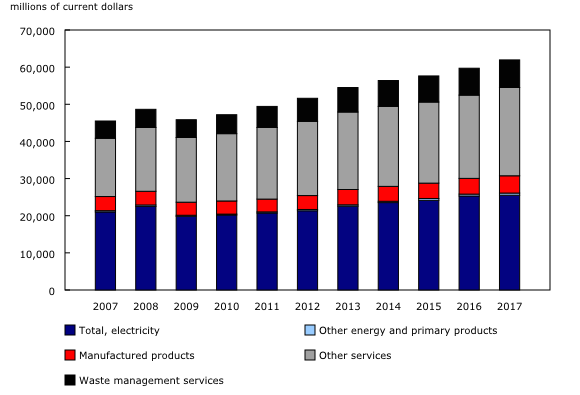 Environmental and clean technology activities, in real (volume) terms, accounted for $58.1 billion of Canadian gross domestic product (GDP) at basic prices in 2017, up 1.3% from 2016. By comparison, the total Canadian economy grew 3.2% over the same period. 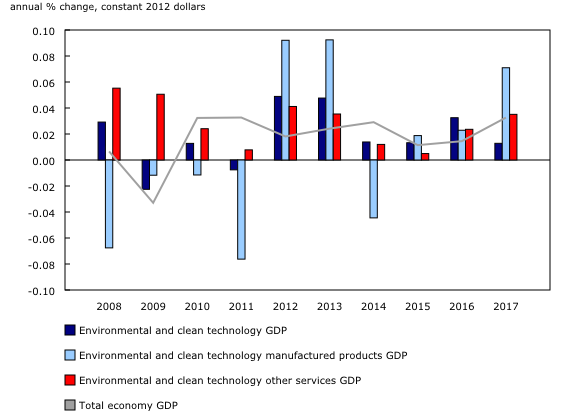 In nominal terms, the value of environmental and clean technology activities totalled $61.9 billion in 2017, and accounted for 3.1% of Canadian GDP. This ratio has remained relatively stable since the start of the time series in 2007. The environmental and clean technology products economic account measures the contribution of environmental goods and services in the Canadian economy, such as clean electricity, waste management, environmental and clean technology product manufacturing and other technical services. The two largest components of environmental and clean technology GDP are clean electricity (41.2%) and waste management services (12.0%). The remaining services, when grouped together, accounted for 38.4%, while manufactured products were responsible for 7.5%, and other energy and primary products contributed 0.9% of total environmental and clean technology GDP. These ratios are similar to those in 2016. Clean electricity's share of total environmental and clean technology GDP fell from 46.2% in 2007 to 41.2% in 2017. At the same time, the contribution of services rose from 44.7% to 50.4%. If waste management services are removed, the contribution of other services to environmental and clean technology GDP rose from 34.5% in 2007 to 38.4% in 2017. Although the volume of environmental and clean technology manufactured products increased by 5.1% from 2007 to 2017, their share of overall environmental and clean technology GDP fell from 8.4% to 7.5%. This was due to the more rapid growth of other environmental and clean technology products categories. Export volumes of environmental and clean technology products increased 3.0% in 2017, accounting for 1.9% of total Canadian exports. This translates to a growth rate of 40.8% from 2007 to 2017. The largest shares of total goods and waste exports were energy (electricity and biofuels), and scrap metal for recycling, which together accounted for 40.7% of all environmental and clean technology exports in 2017. Grouped together, manufactured products represented 64.1% of Canadian total environmental and clean technology exports, while exports of other services represented 8.2% of that share. Import volumes grew 11.6% in 2017 since the previous year, and were up 39.8% from 2007. Environmental and clean technology product imports accounted for 1.7% of total Canadian imports in 2017. That year, manufactured products accounted for 82.8% of total environmental and clean technology imports. Imports of other services represented 8.5% of that share. An estimated 282,045 jobs were attributable to total environmental and clean technology activity in 2017, or 1.6% of jobs in Canada. This represented a 1.9% increase from 2016. The average 2017 annual labour compensation per environmental and clean technology job, including benefits, was $94,000 (an increase of 2.6% from 2016), compared with an economy-wide average of $63,600. Just over half (50.6%) of the total environmental and clean technology jobs were attributable to the delivery of other services not related to waste management, 21.4% to the production of clean electricity, 14.6% to the delivery of waste management services, 12.7% to the manufacturing of environmental and clean technology products, and 0.6% to the production of other environmental and clean technology energy and primary products. The Environmental and Clean Technology Products Economic Account (ECTPEA) measures the economic contribution of environmental and clean technology products in terms of output, gross domestic product (GDP), employment (number of jobs) and other economic variables. Estimates are directly comparable with national results for the Canadian economy. Estimates of GDP referred to in this release are measured at basic prices. Estimates for 2016 and 2017 are preliminary estimates, and will be revised when updated data become available, including the Supply and Use tables for those reference years. Estimates for 2007 to 2014 were revised. Environmental and clean technology is defined as any process, product, or service that reduces environmental impacts: through environmental protection activities that prevent, reduce or eliminate pollution or any other degradation of the environment, resource management activities that result in the more efficient use of natural resources, thus safeguarding against their depletion; or the use of goods that have been adapted to be significantly less energy or resource intensive than the industry standard. As part of the Government of Canada's initiative to develop a Clean Technology Data Strategy, the ECTPEA provides comprehensive measures of the supply and use of environmental and clean technology products in Canada's economy. The ECTPEA has a broader scope than the Survey of Environmental Goods and Services (SEGS) and captures economy-wide transactions in the environmental and clean technology sector, including elements such as clean energy and scrap metals. The government and non-profit sectors are also fully covered in the ECTPEA. The compilation of the ECTPEA draws on a variety of data sources, including Statistics Canada's Supply and Use Tables, detailed import and export statistics released in Canada's Balance of Payments, and SEGS. Examples of environmental goods and services and clean technologies are available in the publication Clean technologies and the Survey of Environmental Goods and Services: A technical reference guide (Catalogue number16-511-X).